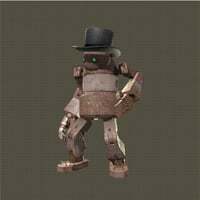 Jean Paul or "Sartre" is a Village Machine in NieR: Automata. "A machine lifeform who lived in Pascal's village and was preoccupied with philosophy. Followers across the land regularly tried to win his favor with gifts, though he regarded such efforts with disdain. He eventually departed on a journey to learn the truth of the world and was never heard from again." Associated Quest: Jean Paul's Melancholy. In the Japanese release, Jean Paul is referred to by the name "Sartre"
His name is a reference to the real-life 20th century French philosopher Jean-Paul Sartre, who is famous as one of the key figures in the philosophy of existentialism. Whenever 9s refers back to him (with voice acting) by his name, a bleep sound comes out instead. Does anybody have any clue why his name is bleeped out when 9S says it? It&apos;s been bugging the crap out of me since a while ago when I first played the game. Wouldn&apos;t it be better to rename this page and it&apos;s quest to the English name of said character? This is after all a wiki targeted towards English readers. Is he the reason Simone wants to be beautiful?